Learn how to read your contact lens prescription to buy contacts online whether you want lenses for vision correction or colored lenses for fashion. It's possible to save up to 70% versus high street or optician prices if you purchase your contact lenses online through a reputable optical retailer like AC Lens or Vision Direct. But many people don't even know what brand of lens they use, let alone what their prescription is! If you want to buy contacts online, do some investigative work and learn what your eye prescription is before you go any further. Sounds complicated? NO, just go the bathroom, get out the box that contains your contact lenses and all the information you need is on the side. You need to understand your contact lens prescription before you can safely order lenses over the internet. See this page for details on how to read your prescription and make a note of the relevant numbers such as BC, Dia and most importantly, the POWER. If you're just buying fashion cosmetic lenses as you don't need them to correct your vision, then you will just order ZERO or 0.0 for Power. Remember that even zero 0.0 Power lenses require you to visit an opthamologist for an eye check. Reputable online optical retailers like AC Lens will ask for your prescription regardless of the Power requested, so without one, you won't be able to place the order. go to an online contact lens retailer like AC Lens and search for your contact lenses by BRAND - this is usually the quickest way to find the one you use. Check the price and make a note, then check at least two other sites, such as Vision Direct, or Discount Contact Lenses to compare prices. Tip: Look for special coupons for additional discounts for first time buyers like these coupons from Discount Contact Lenses. You will need to compare single box prices and also multi-buy prices, usually denoted by the term "lowest price" - this simply means you get a discount if you order a minimum of 4 or 8 boxes. Once you have found the cheapest price, check whether any further discounts are available such as free shipping for first time customers, 1st purchase coupon codes, or additional discounts for ordering contact lens solution or eye drops at the same time. Enter your name and shipping address details, then place your order. A reputable optical company like the one I use will send an immediate order confirmation via e-mail and then update you as the order is processed, usually within 24 hours. They will also keep you informed if there are any problems with the order, for example, some heavy items like contact lens solutions cannot be shipped outside the US. So you see it's really easy to buy contacts online and save lots of money. 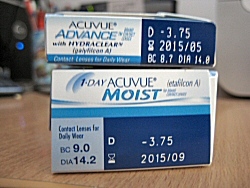 I now order a year's supply of lenses in one go (8 boxes), saving $$$.